Promising to be one of the most-talked-about CORAL issues ever, September/October’s cover is a showstopper— a definitive look at state of the most popular and beguiling marine aquarium fishes today, starting with wild clownfishes and their fascinating geographic diversity, and ending with an astonishing catalog of their captive-bred genetic “designer” forms and hybrids. 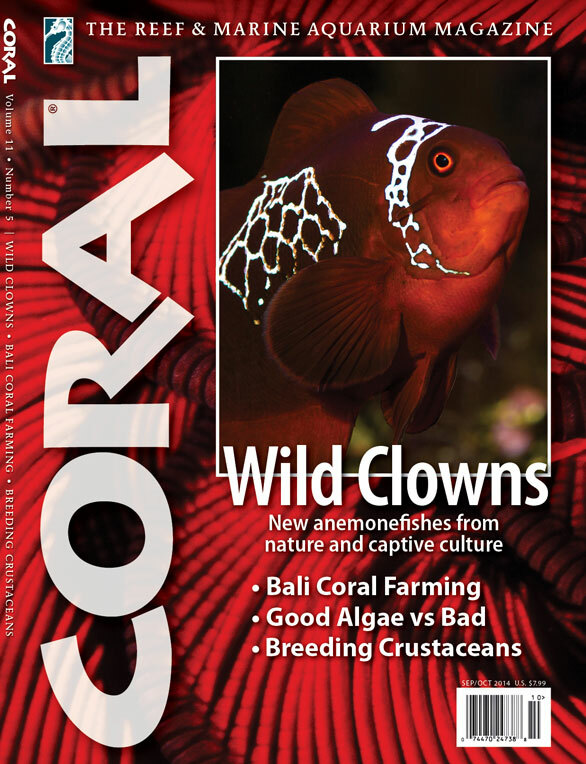 Whether your preference is for the classic beauty of a wild-form Percula or a premium Picasso Percula with a staggering price tag, the next issue of CORAL will broaden your knowledge and appreciation of anemonefishes from the genera Amphiprion and Premnas. Contributors of articles and images will include a star-studded CORAL Team led by Senior Editor Matt Pedersen (first to breed the Lightning Maroon Clownfish shown below) with a portfolio of glorious images by Scott Michael, Gary Bell, Matt Wittenrich, Daniel Knop, Denise Nielsen Tackett, Larry Tackett and others. DEADLINE for materials to be included in this issue: Friday August 15th. The issue will reach homes and stores in the first week September, 2014. Cover Image Credits: Lightning Maroon Clownfish Image by Gary Parr | Background Red Crinoid by Denise Nielsen-Tackett. Fish shown is the world-famous wild Prenmas biaculeatus anemonefish collected in Papua New Guinea by the former SEASMART sustainable livestock project and successfully used by Matt Pedersen to establish a captive-bred strain of the Lightning-type Maroon Clowns. More about this in the September/October issue of CORAL. Now I’m like, well duh! Truly thafnkul for your help.